Meet André Nijhof, Professor Sustainable Business and Stewardship at Nyenrode Business University. I interviewed André in the restaurant for faculty and execs, in which I worked many hours during my own time at Nyenrode. Here’s what he shared about his personal drivers, responsibility and intent. We started the conversation from his vision of a sustainable future, in which every individual has a deep sense of connection to nature, to others and to the impact of his or her own behavior. In this world, people do not wait for others to lead, but take responsibility themselves to resolve tensions and mismatches in society. In André’s sustainable future, people are conscious and clear about what they stand for, rather than immediately jumping into action. In today’s world, this type of commitment is often missing, at both the individual and organizational level. His vision of the future holds his theory of change within it. In all industries, there are companies leading the way, providing their peers insight into the opportunities of more sustainable business practices. Within such organizations, there are individuals leading the way, continuously pushing themselves and others to take conscious decisions to find ways that reduce negative impacts or boost positive ones. For individuals to be the true drivers of change, they need to start from personal conviction, a deeply personal belief of what they stand for and believe. Only then can leaders collaborate with like-minded partners to drive systemic change. And in driving change, vulnerability is key. Showing not just the possibilities but also the dilemmas and challenges, makes people more authentic and credible, and hence better partners for collaboration to jointly find the answers. At this point in time, the ambitions of individuals and companies perhaps aren’t set high enough, but with millennials increasing their influence in organizations, André is hopeful ambitions will continue to grow. Increasingly, full time master students focus their thesis or internship on sustainability, showing a deep interest at the personal level. André is particularly concerned about people losing touch with nature. 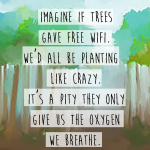 So many people place themselves outside of the natural ecosystem, rather than viewing humanity as an integral part. His personal connection to nature stems from his early youth, citing memories of trips to the local forest with his grandfather to pick blueberries. As a child, he was actively involved with the World Wildlife Fund and engaged with inequality issues in the world. After high school. instead of taking over the farm on which he grew up, he went to study business to expand his horizon. His PhD research focused on ethical business practices and moral considerations. As a business school professor, André feels he has many opportunities to be a driver of change. 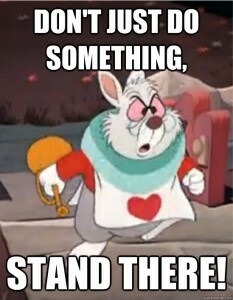 Especially the executive programs offer a great platform to trigger curiosity among the executive participants. He likes to help peoples find their own intent, their own fundamental way in which they want to contribute to a better world. When this is clear, it is much easier to find relevant partners, to innovate, to create different kinds of added value, and to align people in their organization for change. In his research paper The glass ceiling of corporate social responsibility: Consequences of a business case approach towards CSR, he argues that through a more instrumental intent for corporate social responsibility, there are limits to how deeply it can be integrated into the business. This requires a much more fundamental intent, clearly radiated by corporate leadership. 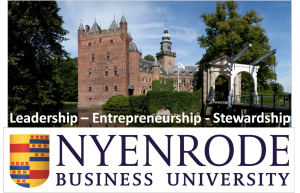 Nyenrode’s mantra is Leadership – Entrepreneurship – Stewardship. André’s personal interpretation of this mantra is to fuel leadership with stewardship intent. What really is in the collective interest in society? How does this compare to the interests of the clients and the capabilities of our team? André likes to instill a sense of awareness in corporate leaders, that they are just a cog in a much larger interconnected system; and that they need vulnerability, authenticity, intent and commitment to be a credible partner for change in that system. André’s inaugural lecture as full professor at Nyenrode took place on July 8, 2016. You can download the lecture via the Nyenrode website (in Dutch). For more information about André and Nyenrode Business University, please check out his profile on Nyenrode’s website or follow @NyenrodeBU on Twitter. Dedication to the cause despite pressing agendas is an admirable personal trait. You cannot discover newoceans unless you have the courage to lose sight of the shore.